Winter arrives early in Vilnius, the capital of Lithuania. Most people agree, however, that Vilnius is a pleasant place to visit in the winter and looks especially lovely veiled in white. Additionally, the pace of the city doesn’t slow except on the very coldest days and the winter holidays offer exciting activities for visitors and locals. A trip to Vilnius in December, January, or February can be ideal if you are prepared for winter weather. Temperatures vary in Vilnius during the winter, with warmer days hovering around freezing. The coldest days can dip down to -25 C (-13 F). However, with the right gear, even -10 C (+14 F) or -15 C (+5 F) is tolerable. Vilnius is not typically windy, but several inches of snow can fall in a short period of time. Snow and ice are likely in Vilnius during the winter. Most people wear shearling or heavy down coats, well-insulated gloves or mittens, and fur caps. Road crews keep walkways salted and sprinkled with sand, which helps with traction, but the occasional icy patches on walkways become treacherous, especially at night when they are less visible. Though local women walk around confidently in heels, snow boots with rubber tread are more practical and safe. Pack practical outerwear, but don’t forget articles of clothing that can be layered. Silk and woolen winter underwear is easy to pack and will keep you warm even when you are sightseeing for hours. Warm socks are a must, especially if ice and snow cover walkways. Events during the winter season in Vilnius are worth taking part in. The Vilnius Christmas markets set up in early December and the Christmas tree on Cathedral Square is a grand addition to the urban landscape. Concerts are available almost daily in the city’s various venues. Markets, performances, and the appearance of Santa Claus round out the Christmas-themed events. New Year’s Eve in Vilnius can be as rowdy or as sedate as desired. Clubs begin selling tickets to their parties early in the month, though that doesn’t stop them from charging exorbitant entry fees at the door on December 31st. January 13th is a day of memorial for the struggle of independence that culminated in a violent attack by Russian forces in 1991. Ceremonies and free entry to the Museum of Occupations and Freedom Fights located in the former KGB headquarters mark this day. And for some colorful fun, Uzgavenes, the Lithuanian version of Carnival, takes place during the month of February. December, January, and February offer a range of activities for travelers. Vilnius’ museums offer a reprieve from the cold weather, as do warm restaurants serving Lithuanian food and bars with good Lithuanian beer on the menu. Music culture in Vilnius is also active during the winter season, with venues providing performance space for concerts, musical ensembles, and soloists. For those who like outdoor activities, a hike to the Hill of Three Crosses or sledding down the slopes of Vingis Park is just a couple of options for enjoying the winter weather. Markets related to holiday events such as Christmas and Carnival are great places for picking up one-of-a-kind souvenirs. 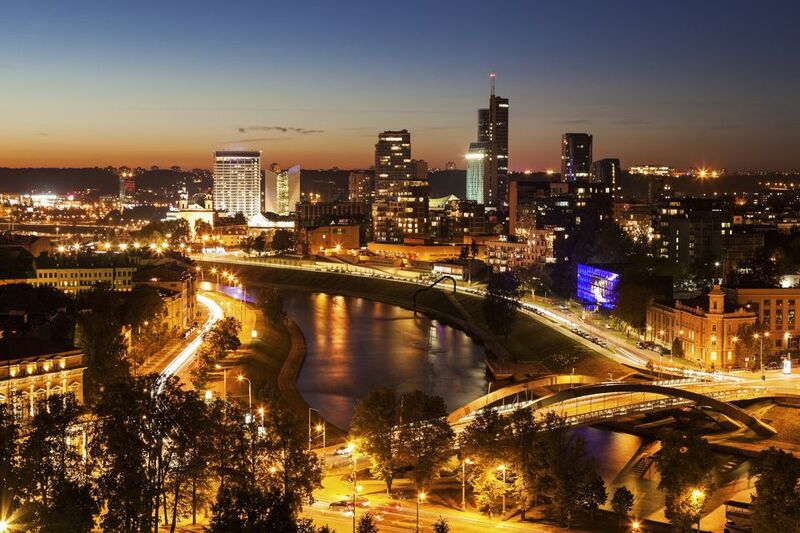 Because winter is a slow season for travel to Vilnius, travel to the Lithuanian capital can be planned more spontaneously than it can be during the summer months. At the end of the week it’s important to make reservations at the city’s finer restaurants, and around Christmastime and New Year’s, advance planning is essential. During this time, you may also want to visit the other Baltic capital cities, which are easily accessible via bus services, by train, or by plane.